The story of Michael Jordan getting cut from his High School basketball team is well known but its importance hadn’t dawned on me until recently. Jordan, a 15-year old Sophomore, was only 5’ 10” and got cut in lieu of his friend, Leroy Smith, who was 6’ 7”. If you know anything about basketball, you know size is really important. But so is the drive and heart of a player. I recently had the opportunity to interview Bill Cartwright, a long-time teammate of Jordan’s who helped to win 5 of the Bulls’ 6 championships in the 1990’s. Though it wasn’t part of the formal interview, Bill shared a story with me that I found really fascinating. 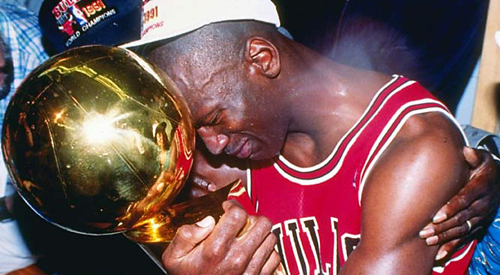 The Bulls in the 1990’s were a phenomenon and one of the greatest sports teams ever assembled. The championships brought tons of fans and inevitable mayhem for the team. The players could not go in public without being recognized and mobbed by crowds of people. This made traveling, an essential part to being a professional athlete, very difficult. They would have to sneak into the back of buildings to avoid the press. They also had to give fake names when staying at a hotel to disclose their identity. Many players chose something silly or random at each stay. Jordan’s name was far from random. His name was Leroy Smith at every single hotel. Think about that. After 20 years, 6 championships and 14 All-Star games, his mind still focuses on getting cut in 1978 at Emsley A. Laney High School. What is the chip on your shoulder that will lead you to greatness?